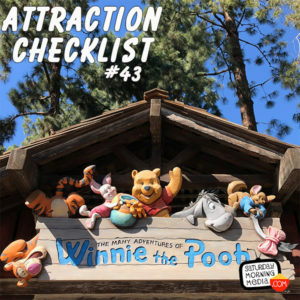 http://www.attractionchecklist.com – This episode takes us to Critter Country in Disneyland to ride The Many Adventures of Winnie The Pooh. First we learn a little about the attraction and then hop in a beehive and experience the ride. Recorded on February 20, 2018. It’s time to head to Critter Country in Disneyland to ride the infamous dark ride, The Many Adventures of Winnie The Pooh. Disneyland guide maps at the time of this recording don’t offer a description for the ride but the Disneyland website says, “Travel through Hundred Acre Wood in an oversized beehive and immerse yourself in the stories of Winnie The Pooh.” There are no height restrictions for this attraction and the Thrill level describes it as being A slow Ride that is dark and loud. Before we hop in our beehive, here are five fast facts about Disneyland’s The Many Adventures of Winnie The Pooh. 1. The Many Adventures of Winnie The Pooh opened at Disneyland on April 11, 2003. To some controversy, especially to me, it replaced the The Country Bear Jamboree that had occupied the land since 1972. 2. Before it’s opening, there were many different plans for a Winnie The Pooh attraction including an outdoor boat ride in Fantasyland and a spinning tea cups-like attraction that would have been housed in Toon Town. These were all shelved and the Critter Country location was finally chosen. 3. To make it appear that Winnie the Pooh is having an ‘out of body’ dream experience before the Heffalumps and Woozles sequence, imagineers use what is called the Pepper’s Ghost effect. This same technique is widely used in another Disney attraction, The Haunted Mansion. 4. Like Fantasyland dark ride attractions, each of the 22 beehive ride vehicles bears a different name. These include Piglet, Rabbit and Heffalump among others. 5. To pay homage to what came before, three characters from the Country Bear Jamboree can be spotted in The Many Adventures of Winnie The Pooh. The busts of Max, Buff and Melvin that once hung in the Mile Long Bar restaurant, can be seen if you you know where to look as you exit the Heffelumps and Woozles scene on the attraction. Also, the narrator is played by Peter Renaday who served as the voice of Henry in the Country Bear Jamboree. And now let’s experience The Many Adventures of Winnie The Pooh. Along for the ride today is Suzie and after we ride, we’ll give you our thoughts on this attraction, and believe me, I have much to say. This is a binaural recording so if you have headphones put them on now as we are about to experience Disneyland’s The Many Adventures of Winnie The Pooh!